Get Rigging and Slinging Safety Certification Online Now! Planning to rig and sling loads on job sites across Alberta, western Canada, or anywhere else in North America? If so, employers will be looking to see that you are certified and aware when it comes to rigging and slinging safety. There’s no room for error or carelessness on job sites, which is why being knowledgeable and certified sets you apart as a worker or job candidate on sites involving rigging and slinging. Will This Course Satisfy I-CAB, CSA, ANSI, and ASME Regulations? How Do I Get My Rigging & Slinging Safety Certification Card? Ready to get your rigging and slinging safety certification card in Alberta or any other province for an upcoming job? Good news — there’s never been a better time to take care of your rigging and slinging safety training in a way that’s convenient, interesting, and gets you ready and ANSI/CSA/ASME compliant for your next job! At the end of our approximately 5.5 hour course, you’ll simply print out your certificate and rigging and slinging ticket as proof of full completion of your rigging and slinging training requirement. What are you waiting for? 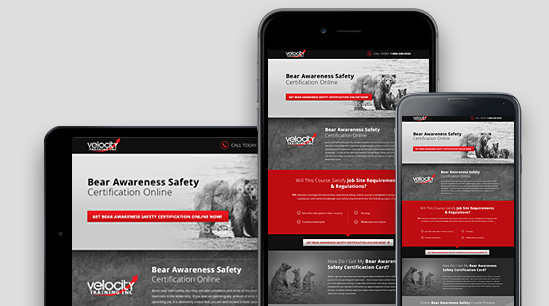 Take care of your Rigging & Slinging safety certification quickly and easily with a fun, engaging online course from Velocity Training!